How did the term “Micro Gardening” originate? In 2007, we were renting a suburban house. It only had a tiny space to grow a food garden. I was recovering from cancer. So I was highly motivated to design a mini urban ‘farm’. I needed fresh, nutrient-dense food to boost my health and immune system. I wanted to intensively grow a diverse variety of food crops in highly productive pots. I knew I’d have to throw out the ‘rule book’ about plant spacing and experiment! I started thinking about creative solutions to maximise space. I began looking at my garden space through a new micro ‘lens’. I analysed the site, with its opportunities and limitations. I looked closer at small details. I began thinking about strategies to help me grow an abundant garden, despite the challenges. Having studied sustainable agriculture, I had experience growing organic food in large spaces. I decided to downscale these biological farming techniques to grow lots of food in our tiny urban space. I didn’t have a lot of energy, so my micro gardens had to be low-maintenance. They needed to be highly productive, colourful and beautiful. They would be my outdoor sanctuary for healing. My garden also had to be sustainable, chemical free, economical, portable and eco-friendly. I needed to garden in just a few minutes here and there. Rather than spending hours labouring with heavy work, I wanted to grow food in small blocks of time but still achieve a lot! I thought “I need to become a ‘micro gardener’. I can use my pots as mini ecosystems with their own microclimates. The soil microbes will do the hard work for me.” I wondered if there was such a thing as micro gardening. So I ‘Googled’ it. For once, there were “no search results”! So at that moment, I invented the term “Micro Gardening”, created this website and became The Micro Gardener! What techniques are used to grow micro gardens? Make your own soil and plant food. Remineralize and balance soil pH. Build healthy soil and choose the right mulch. Use efficient water management practices e.g. water harvesting, self-watering pots, drip irrigation and wicking beds. Cycle nutrients to maximise plant health and minimize waste. Utilise space wisely e.g. vertical garden solutions and espalier. Consider portable options for temporary gardens and to optimize sun and shade. Identify and use microclimates to your advantage. Work with nature to minimize problems and optimize harvests e.g. moon gardening, microbes, beneficial insects, guilds and intercropping. Rotate food crops in containers and raised beds. Utilize the embodied energy in materials by upcycling e.g. using repurposed containers. Plant diversity to improve pollination. Observe small details in garden ecosystems. What are the key features of micro gardens? Grow plants using 100% biological and organic strategies. 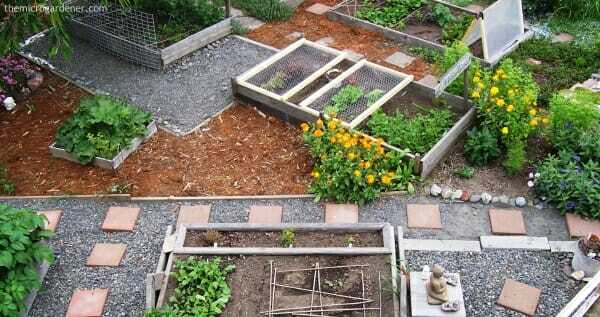 Maximise small spaces using Permaculture design principles. Plant health centres round a ‘closed loop’ nutrient-cycling system. Kitchen ‘waste’ organic matter is recycled to feed the garden. This in turn, produces food for the gardener’s plate. Sustainable closed loop cycles provide the majority of the garden’s supplies. These include mulch, seeds, new plants and soil food. Micro gardening focuses on soil health. Local organic materials are used to create soil and plant food. Microclimate management optimises food production and extends harvests. Mutually beneficial relationships between plants, insects, birds, microbes, animals and people. Urban Permaculture strategies. These include polyculture, interplanting, perennial edibles and multi-functional plants. Optimizing patterns and edges in garden design. Regular observation. Looking at the little details in your garden. Minimal time, energy and money inputs as your garden matures. Efficient use of available resources. Respect for soil and plant life. Always give back to nature more than you take. What size are micro gardens? Micro gardens can be as tiny as a few square centimetres such as microgreens. They can be grown vertically to maximise space. Or be several square metres long in a garden bed. 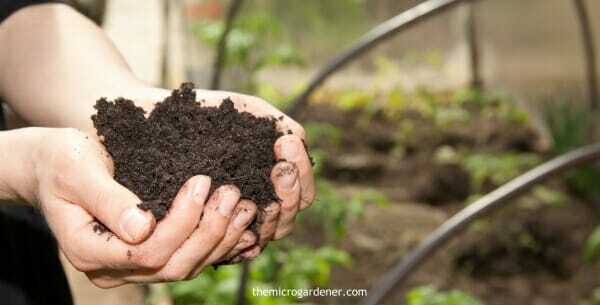 How important is soil when micro gardening? Your growing medium is critical to success. Intensively food farming in small spaces can be very hard work. Especially if you use cheap bagged potting mix or poor quality soil. To grow edible micro gardens that produce a continual abundance of healthy nutrient-dense food, requires some effort to get your soil right. You can make your own potting soil or amend a bagged mix. These are just two ways to include a living community of beneficial microbes and nutrients for plant health. Whether you grow food in a container or garden bed, healthy soil is vital for success. Healthy soil contains a living community of beneficial microbes and nutrients for plant health. What role do microbes play in micro gardens? 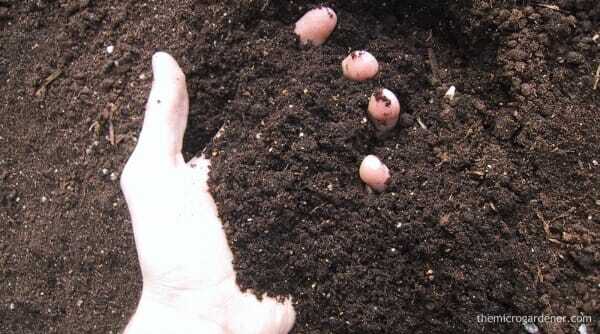 Microorganisms (microbes) are your soil’s ‘invisible workforce.’ Despite their size, they are important free workers. Beneficial microbes help create a healthy environment in your soil. These tiny microbe communities recycle nutrients to feed your plants. They also help protect your plants from pests and diseases. Having a micro understanding of how these free labourers can be put to work on your behalf, can significantly help boost your harvest. Why are microclimates important when micro gardening? Extend your harvest for a wide variety of edibles. Grow plants you may not have been able to grow before. Have optimal control over sun, shade, wind, soil and weather conditions. Utilise natural or man-made structures to your advantage. Select the right plants, pots and growing environment. Protect your gardens against damage from frosts, heat and other problems. Thoughtfully design your space to create a more resilient, productive and healthy micro garden. Spend minimal time, money and energy to maintain. Observe and record the unique sun, shade, wind, soil and weather microclimates in your garden. 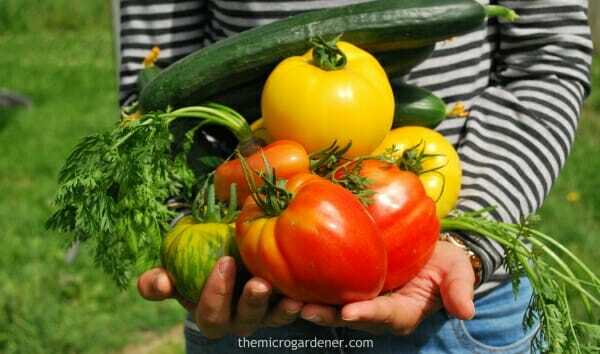 What are some of the benefits of micro gardening? 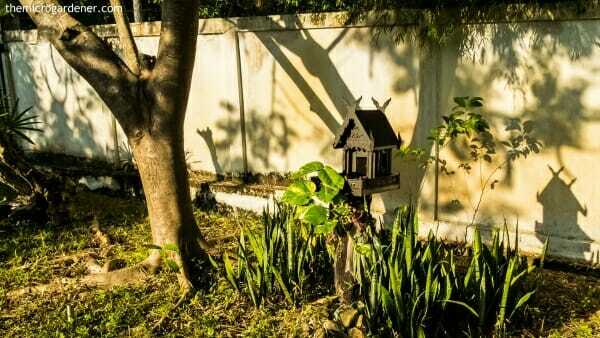 Downsizing a garden has many advantages. 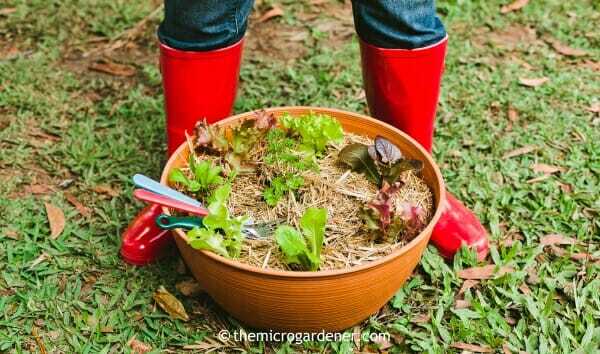 Micro gardens don’t require heavy labour, expensive equipment or materials. They are cheap to establish and maintain. They are easy to access and help you grow good health. Being self-sufficient to some degree is a really satisfying reward for minimal effort. Plus the health benefits of fresh ingredients in your diet! What are some examples of micro gardens? You can grow micro gardens in even the tiniest of spaces. Sprouts: Grow sprouts from seeds in a jar indoors. You don’t even need a garden to grow them! Just rinse and drain 2-3 times a day. They’re ready when they germinate or ‘sprout’. Microgreens: Raise seeds in a tiny container of seed raising mix. Once the young seedlings have two true leaves, harvest your microgreens with scissors. From seed to feed in 7-21 days depending on the variety. Microgreens are a healthy ‘fast food’ everyone can grow. Herbs: Culinary and medicinal herbs are easy to grow. Group herbs with similar water and sun needs together. Repurposed baskets make attractive planters and edible gifts. 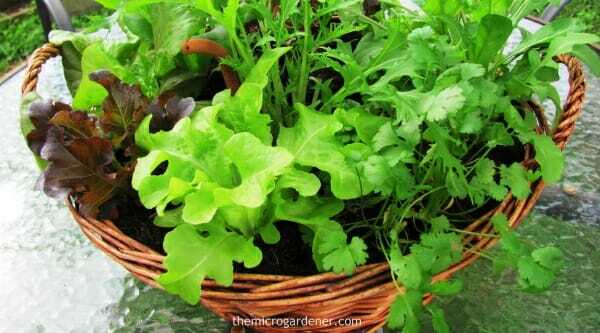 Pick ‘n’ Pluck Salad Bar: Plant loose leaf lettuce varieties for a ‘quick pick’ salad. Choose ingredients with different leaf textures and colours. This is a fast growing garden in a pot. Stackable Vertical Gardens: A space and water saving solution. Maximise the number of plants you can grow in a tiny space. Group plants with the same water needs together on each tier. Meals on Wheels: An easy solution if you are moving house. Or if you want to control sunlight during the day. By using castors, even heavy planters can be moved easily. Who can be a micro gardener? Micro gardening opens up food growing possibilities for everyone. It’s for city dwellers; apartment and balcony gardeners; suburban gardeners; renters; mobile home and tiny house owners; and even travellers. With careful plant choices and utilizing sun and space wisely, almost anyone can grow a compact garden! Can I earn money with micro gardening skills? Selling surplus produce, seeds or plants. Becoming a consultant with your own clients. Teaching micro gardening skills to others. Learn to grow an abundance of healthy food and you have many ways to earn a home-based income. How do I learn about micro gardening? This website is a free resource of information. It’s a starting point. I present workshops locally, so join my newsletter to receive your personal invitation. Check out my online library of articles here.